Updated: One of the most basic requirements for adoption of electric vehicles is having a place to plug in. 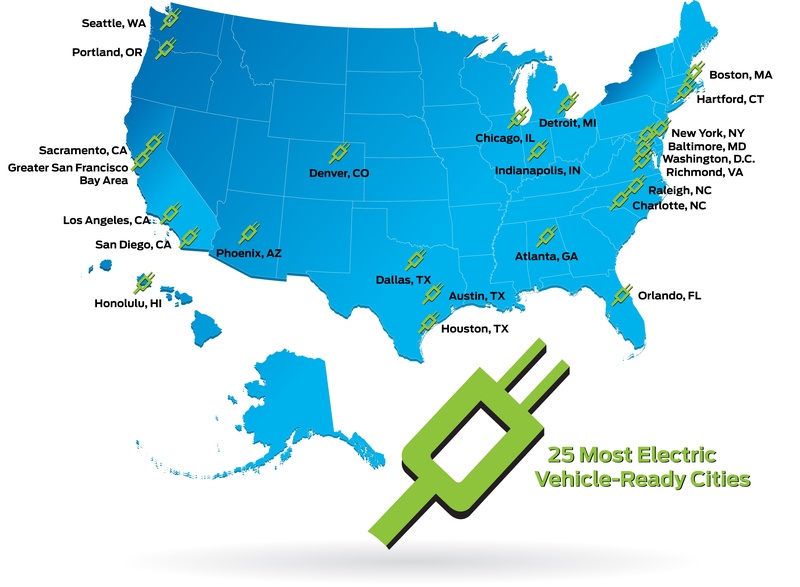 But according to Ford Motor (s F), which released its list of 25 cities leading the way with “electric vehicle-readiness” on Wednesday, paving the way for an influx of EVs means going far beyond charge point installations. At a time when public funds are supporting the installation of thousands of charging stations nationwide by 2012, Ford Vehicle Electrification and Infrastructure Manager Mike Tinksey says the number of charge points isn’t what matters most. Rather, it’s about the approach to installing those stations, and the processes and programs in place to help knock down a range of barriers to adoption over time. Barriers vary by location. For example, offering discounted electricity rates for “off-peak” or night-time charging will generally “really help electrification,” said Tinksey. San Francisco, a city Tinksey said is a clear leader among the top 25, has these so-called time-of-use rates in place. Other leading cities earned points because of similar plans moving through regulatory commissions. Yet a city like Seattle “needs it less,” he said, because abundant hydropower in the area helps keep electricity rates relatively low. For “urban dwellers who typically don’t have the same parking spot” each night, workplace charging at corporate campuses will offer an important alternative. Public and private fleets will generally rely on centralized “depot” charging, said Tinksey, while public charging will be used least frequently. The company wants to see “an urban planning approach” to public charging infrastructure, incorporating charge points and signage into the city landscape in a way that will maximize the use of each location. 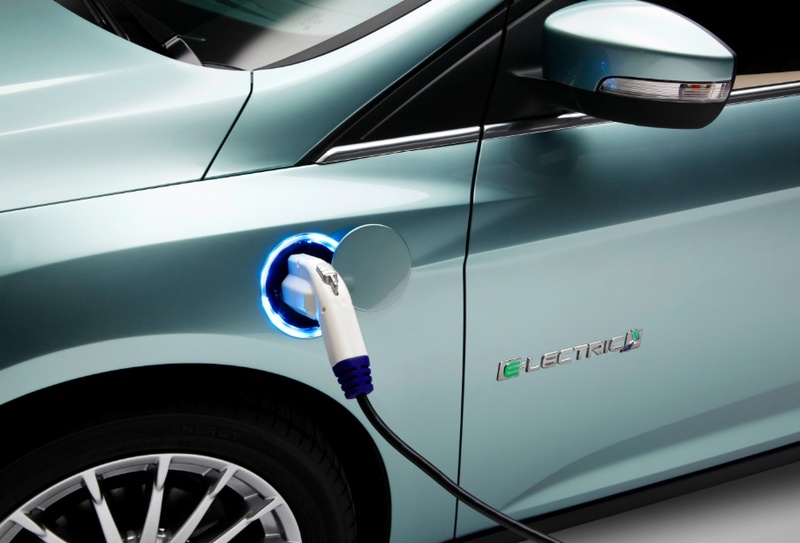 Ford is not the first entity to assess EV readiness, and as Tinksey put it, “It’s pretty safe to say there’s considerable overlap” between this latest ranking and lists compiled by others in the industry, or the Rocky Mountain Institute’s Project Get Ready. So why did Ford go to the trouble of creating its own scoring matrix and list? According to Tinksey, each manufacturer has different priorities and a unique perspective on what makes a city ready for electric vehicles, depending on their vehicle design and strategy. Because Ford has designed the Focus BEV (due out this year) to carry a “larger onboard charger” for charging at home in less than three hours, Tinksey says the company is “endorsing a much larger charging station,” as well as a larger gauge wire to accommodate it, and a separate outlet for easy diagnosis in the event of a malfunction. On board charger? A transformer? That’s something else to carry. What is needed is contacts embedded in the Interstate System. Pay by EZ Pass swipe. Then a minimal battery is needed as most of our driving is done on Interstate even locally. Let’s fix our infrastructure instead of fighting the next war. Go Ford. Make this work and I’ll get rid of my ’86 F350 diesel. I’ll buy my second new Ford, an electric. I have a selection of transformers, like for electric forklift etc. Californiaâ€™s electricity rates are 35% higher than the national average (around 14.42 cents per kWh), charging the Volt and many electric cars is still far, far cheaper than filling up a tank of gas. Dynamic pricing and Off-Peak charging of the electric vehicles are the key to success for the EVs. Once consumers gain more insight on the EV cost advantage over gasoline powered vehicles the transition will be far easier than previously imagined. This analysis does not include the cost externalities of gasoline powered cars, such as air pollution, water pollution (EVs don’t require motor oil to lubricate the pistons), and in most cases noise pollution.